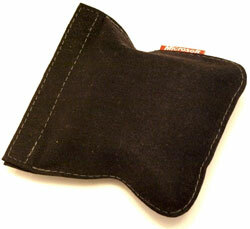 The Arc brings a unique folding design to the portable mouse combining at once style and portability. Despite a few usability and functional issues, the fundamental concept is well executed and well worth the price. The major talking point about the Arc Mouse is the unique shape. When open, a symmetrical smooth boomerang curve that looks poised and ready to leap. When closed, a crouching low-to-the-ground turtle disguised as a mouse. The shape works very well in the hand, and the hollow bottom provides a great place to wrap the non button fingers around for a good grip. The two main buttons fall easily to hand, and click softly, sounding almost exactly like a BMW turn signal. The rubberized scroll wheel, while easy to use, is only of the basic variety, and a bit “clicky” and cheap sounding for my tastes. In a quiet environment, it’s downright obnoxious to fellow library patrons. There are no whiz-bang scroll wheel features, just vertical scroll and wheel click. Given the overall design, it would be great to see a nicely machined aluminum wheel with a bit more heft – like the one used by the equally new for 2008 Explorer Mini. The top of the Arc Mouse is finished in an extremely high-quality glossy paint with a glass-smooth finish. My red sample was absolutely flawless, and has faint metallic flecks in it as well. Such a shiny finish would seem to imply a lack of scratch resistance, but in my two weeks of travel on trains, planes and in cramped hotel quarters, I’ve seen no hints of blemish. The Arc Mouse, while symmetrical, appears at first not to be lefty-friendly, as there is only one side button for right handers. However, the placement of this side button renders it completely useless. It’s at least 15mm too far towards the front of the mouse to be accessible by thumb. In fact, the only way to side click is to hold the Arc Mouse “claw” style with index and middle fingers curved, but then normal clicking is not comfortable and scroll wheeling is impossible. Lefties, on the other hand, (sorry, bad pun), have no such difficulty and can easily use this side button with their ring finger. I’m sure this was not Microsoft’s intention, and so I have to say this side button is a major design flaw on an otherwise well designed product. 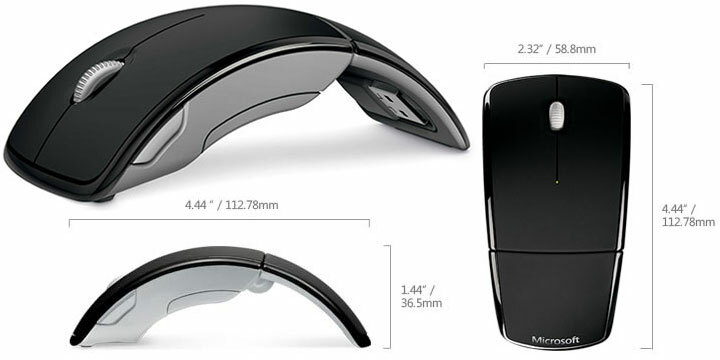 The Arc Mouse is packaged almost like cosmetics – in a beautiful, see-through plastic box. The mouse itself is a glistening, glossy sight to behold, and artfully opens up to futuristic semicircular shape, quite appropriately, an arc. Unfolding the Arc Mouse reveals a tiny USB dongle hidden in a crevice on the underside of the folding “wing” which becomes the mouse palm rest. Both the underside and the sides of the mouse, and the exposed surfaces of the wireless dongle are finished in a rubberized paint, in my case, a matte dark red. Alkaline batteries are included, but, in a nod to the internet saavy consumer, no driver CD is included in the package. This cost-cutting is very unfortunate if you saved the unboxing for a long road trip and don’t have immediate access to the internet to download the drivers. Overall, build quality is top-notch and if the Arc Mouse’s performance lives up to its looks, Microsoft will have a winner on its hands. The size of the dongle, while not the smallest I’ve seen, is impressively discreet when in use. Given that the install CD is nowhere to be found, you’ll need to navigate Microsoft’s site for the Intellipoint 3.0 drivers for Mac OS X. It is worth mentioning that the mouse will work without the drivers, in case you need to use the mouse to install the software. However, the tracking is hypersensitive compared with standard Apple mice – you’ll find yourself piloting the mouse like a valet parking your 1000 hp Bugatti Veyron in the supermarket parking lot – lurching and overshooting everything in sight until you recalibrate your lead foot, er, mouse hand, or turn down the tracking speed in System Preferences. Once you’ve downloaded the drivers, installation will go smoothly with just a few mouse clicks. After installation (which requires a restart), your mouse pointer will be brought back under control at a speed similar to before. No surprises here – each button can be assigned a function from a predetermined list. You cannot record a custom function or script to serve as a button action. You do get the ability to create sets of settings which are application-specific. This is a nice touch, if for example, you like a slower tracking speed and remapped buttons for your detailed Photoshop work. Moving on to the Pointer Options tab, you get the ability to adopt the tracking speed from the Keyboard & Mouse System Preferences, or override it by setting your tracking speed with Intellipoint. 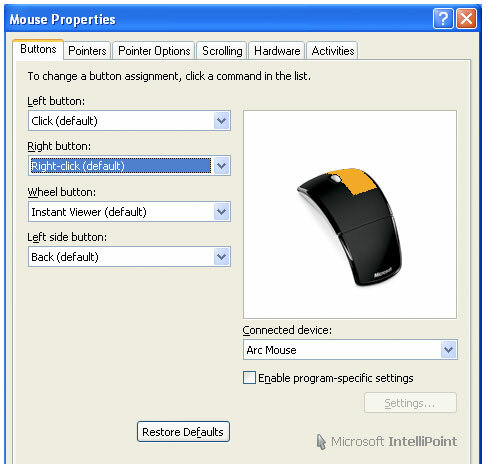 I found that the Arc Mouse just “felt” better when the driver was set to Intellipoint pointer speed. Perhaps appropriately, the custom Microsoft driver tunes acceleration and tracking curves for their own mice. Lastly, you can adjust the scrolling speed of the wheel. 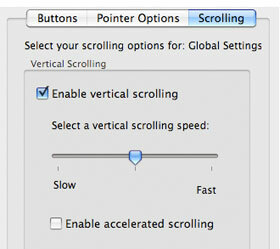 Enabling accelerated scrolling allows the scroll amount to increase with the speed that you spin the scroll wheel. Fine (line by line) movement is enabled by spinning the wheel one click at a time; gross movements are obtained by spinning the wheel faster. This option is intuitive enough, and something that the built-in mouse drivers of Windows and Mac OS already support by default. Again, given the lack of included CD, you can let Windows try to detect the new hardware and install the required drivers, or you can download Intellipoint 6.3 yourself and install it manually. I chose the latter. The install process is straightforward, except for one issue: the instructions on the first dialog box are rather misleading as the product name is nowhere to be found on the bottom of the mouse, on the label, or anywhere on the dongle. It should not be a huge deal, since the Arc Mouse has no Microsoft relatives with similar names, but this is a disadvantage to having one piece of software support so many different mice products. Moving on from the installation process, the mouse control software is easy to use and builds upon the standard mouse Control Panel that ships with Windows. Intellipoint for Windows includes a number more features as compared to the Mac version. Assignments for all four buttons can be selected, as well as having your selections apply only to specific applications. The five other tabs deal with the expected adjustments such as pointer acceleration, scrolling, double-click speed, and ClickLock, which lets you drag or highlight without holding the button down. Unlike the Mac version, you can customize the speed of accelerated vertical scrolling independently from the rate of vertical scrolling. 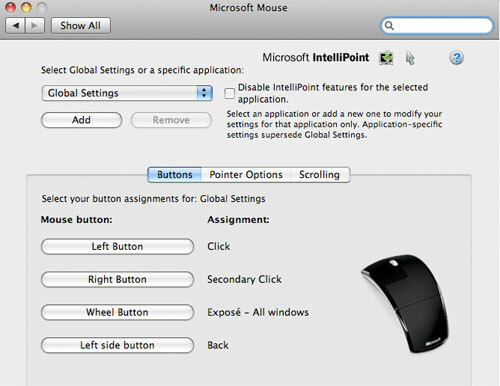 The scroll wheel click accesses an Exposé (view all windows) function on Mac and Windows – great because you don’t have to lift your hand from the mouse to navigate to other open windows. All in all, Intellipoint does what you’d expect. Nothing more, nothing less. I spent nearly two weeks as a road warrior with the Arc Mouse: checking email, editing digital photos, writing documents, and surfing the Internet. I had the opportunity to test the tracking on a wide variety of surfaces, including plate glass, etched and frosted glass desks, airline tray tables, fine linen restaurant tablecloths, and wood and laminate tables. Pointer tracking was largely smooth and trouble-free, however the Arc Mouse does not work on glass desks of any sort. This comes as no surprise, as Microsoft sells other mice with this capability. I found the overall shape of the Arc Mouse to be spot-on for the way I like to use mice. It is big enough to keep the majority of your palm off the desk, but allows you to rest the wrist on the mousing surface for precise control, and to prevent fatigue. The Exposé function of the scroll wheel click is very useful to switch between active windows without lifting hand from mouse. 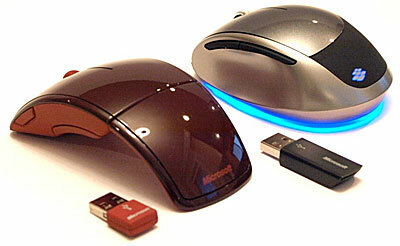 The rubberized sides do allow you to get a good grip and the friction-reducing pads help the Arc mouse glide smoothly. I learned to altogether avoid trying to think up a good way to utilize the side button and just treated the mouse as a three button device. 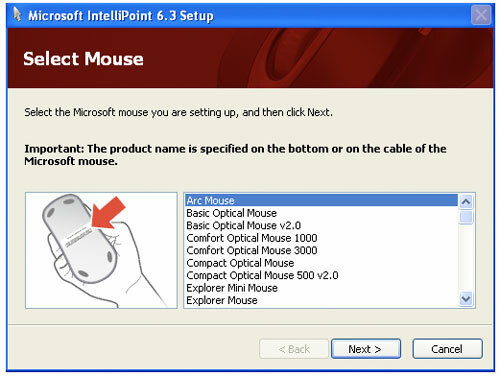 The Intellipoint software breaks no new ground in mouse control, but its installation did prove to be a minor annoyance that really could be avoided with the inclusion of a CD in the box, and more precise on-screen instructions. At the end of the day, I found myself wishing that the Arc Mouse could take advantage of Bluetooth that is built-in to every modern laptop sold today. Although the magnetic dongle holder is clever, and the wireless dongle itself is small, it’s just another little piece to forget or misplace if you do a lot of traveling, which this mouse otherwise excels at. It took me a while to notice, but in the little crevice dividing the left and right mouse buttons hides a bi-color LED battery indicator. Folding the mouse for travel also turns it off, so when the mouse is unfolded, the battery LED turns on to indicate the charge remaining. Green for satisfactory, red for low charge. The light stays on only for about 10 seconds. On the underside of the mouse lies the battery compartment, which houses two AAA batteries, and a little well that smartly serves as a magnetic holder for the USB wireless dongle. Just place the dongle here, fold the mouse to encapsulate the dongle, and pop the works in the provided imitation suede carry case. Nice. The elegant carry case, a nice included feature, has a weakly magnetic catch on the lip to secure its contents without straps or snaps or zippers. This Fall, Microsoft released two portable wireless mice into the wild: the Arc Mouse reviewed here, and the Explorer Mini Mouse with BlueTrack technology. Here’s a visual comparison of the two mice. In my review time with both mice, I found the Arc Mouse to be the far better travel mouse because of the folding design with magnetic dongle holder, smaller dongle, and carry case. However, the Explorer Mini is the better travel mouse for desktop use, with better tracking, a more solid feel, and a smooth, expensive-feeling scroll wheel. It is a clunky option for travel because the large dongle, when stored in the snap-in location, is easy to lose and protrudes awkwardly from the bottom of the bulky mouse. I enjoyed using both travel mice; your choice should depend on what importance you place on portability. Microsoft takes a rare industrial design risk in order to come up with a truly innovative new entrant into the portable mouse market. Despite a few flaws in usability and set-up, the Arc Mouse is an excellent travel companion, and capable of replacing the general-purpose desktop mouse for those who have fairly basic requirements. Microsoft really must be commended for giving the road warriors a beautiful, ergonomic alternative to a bulky mouse or annoying trackpad, and for that reason alone, the Arc Mouse is a worthy recipient of my recommendation.